Do you want your products to receive more publicity? Then advertising in Facts are Facts might well be just what you need. Facts are Facts is a Swiss family business. Our German edition, ZeitenSchrift, has been available in Germany, Austria and Switzerland since 1993, and we can now claim with some justification to be the most important esoteric magazine appearing in the German-language marketplace. 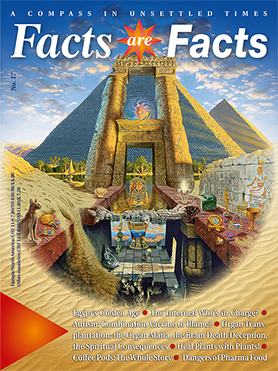 Facts are Facts is a quarterly and tackles three main topics in each edition: health and science, spirituality and esoterica, and politics and society. For years, Facts are Facts did not carry advertising. We recently made the decision to make advertising space available: we believe that there are numerous small-scale suppliers and little-known products out there that can have a positive impact on our lives and our general sense of wellbeing, and are worth presenting to an interested readership. Everyone benefits. The advertisers above all, because Facts are Facts enjoys a high level of credibility among its readers. By advertising with us, you can benefit from the reputation that we have earned over the years. What makes us different, and what our readers value about us, is that we are independent of any special interest groups or institutions. We deal in plain hard facts and in giving our readers a new perspective. And as they have told us again and again, Facts are Facts readers don’t just read selectively, they read cover to cover. That means they are reading your advertising too. Not to forget that our magazine isn’t read for just three months: back issues continue to be ordered by our readers for years to come. That means your advert will enjoy awareness for much longer than average. However, the high standards we set for ourselves mean that there are some restrictions. We do not accept adverts for products or practices that are damaging to nature or limit human freedom of choice. That means, for example, no fortune telling, astrology, tarot, or channelling. We are taking this course of action, because we intend to uphold our responsibilities as journalists to the very best of our ability. Please bear this in mind if we have to reject certain adverts. We remain well aware that in all areas of life there are responsible, sincere people with only the best motivations, who are driven by more than just financial reward.